Haiti: Supported the Foyer Evangelique Orphanage administered by Pastor Dukens to purchase food, school supplies, and clothing so the children can go to school. Supported CHABHA and hosted coin rolls to cover the costs of health cards and school fees in program that supports nearly 3000 children. Children who have grown up in their grassroots group and have finished high school, and for some, university are now working in jobs so they can support themselves and their families, thereby stopping the cycle of poverty. Contact Susan Wilson at 536-4661. This article in the News of the Diocese tells of a recent connection between our children and children in Kigali, Rwanda. 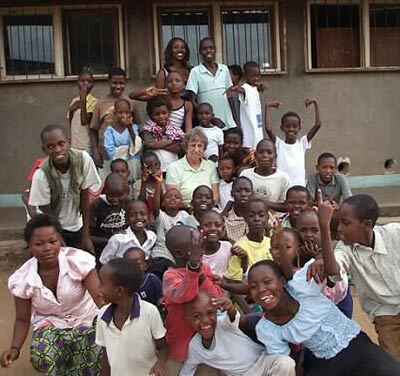 At the suggestion of the Outreach Team at St. Michael’s, Brattleboro, our children Skyped with children in Rwanda! It was March 1 and cold here in Vermont, but warm in Kigali. CHABHA, Children Affected by HIV/AIDS, an organization founded in Vermont and supported by several churches in the diocese, partners with several grassroots groups in Rwanda and Burundi that help children whose parents have died from the disease or whose parents are ill. CHABHA provides health cards, school costs, after-school programming, fun-filled gatherings, home visits, and skills training. St. Michael’s furnishes CHABHA with office space and, for some years, has contributed financial support. When they saw the huge icicles hanging from the eave of our classroom, the Rwandan children said, “Sorry, sorry.” We had to explain that winter could be fun, too.